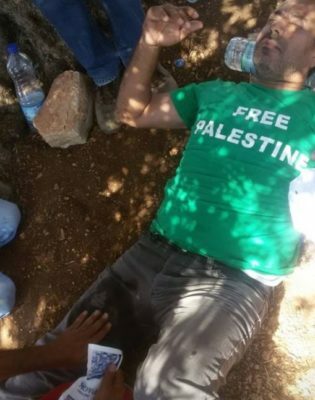 Israeli soldiers attacked, Friday, the weekly nonviolent procession against the Annexation Wall and Colonies, in Bil’in village, west of the central West Bank city of Ramallah, wounding one Palestinian. The protesters, including Israeli and international peace activists, marched from the center of the village, heading towards the orchards, isolated behind the illegal annexation wall. The soldiers started firing gas bombs and concussion grenades, causing many to suffer the effects of teargas inhalation, and shot Ahmad Abu Rahma with a rubber-coated steel bullet in his leg. The Israeli gas bombs and concussion grenades also caused fire in olive orchards, burning many trees, while many persons suffered the effects of teargas inhalation.